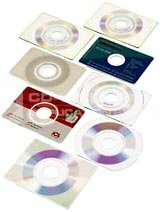 Our Recordable Business Card CDs are the specially made CD-Rs, the size of a Credit card or Business card, which play in any normal CD player, and weigh only around 10gms. With them you can create, burn, label and present fast. These cards DO NOT work with PressIT business card labeller or ANY PressIT labelling solution. Picture for illustration only. These cards are rectangular and white inkjet printable. CD . Business . Cards . white . printable . - . 46.8MB . with . plastic . sleeve . Pack . of . 100 . Unbranded .